Las Gallinas emerges from the Shadow of Leming. A letter received at 9:16 p.m. on November 4th addressed the long-standing confusion between the community of Las Gallinas and its near neighbor of Leming. While our town pages included Leming, Las Gallinas was mentioned as being Leming’s former name. The source of the confusion seems to be an entry in the Handbook of Texas and the fact that Las Gallinas has no official signage. The letter was forwarded to Terry Jeanson in San Antonio. Mr. Jeanson, who has an interest in anything regional to his beloved San Antonio, drove to Las Gallinas the next morning. The places mentioned in the Rakowitz letter were photographed by Terry and sent to the TE offices at 12:10 on November 5th. This doesn’t quite break a response record, but since the all-time record response time is also held by Mr. Jeanson, it’s a moot point. Thanks to Mr. Rakowitz and Mr. Jeanson, Las Gallinas now has a separate identity – at least in our pages. We hope that the town will soon receive its own signage and that a long-overdue ribbon-cutting ceremony can be arranged. The community of Las Gallinas, Texas is not the same as the town of Leming, Texas. Las Gallinas was settled in the mid-1800's by immigrants from Silensia, Poland. My great grandfather purchased land and settled there with his family in 1867. Las Gallinas still exists today. It is located approximately 3 miles north of Leming, on Hwy. 281. The heart of the community is located at the intersection of FM 536 and Hwy. 281, and includes much of the surrounding area. The creek that runs across 281, and then crosses FM 536 is the Las Gallinas Creek. 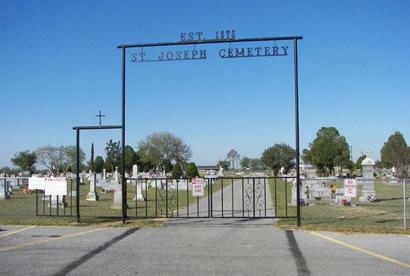 Besides the creek, about the only other landmark that still exists in the community today is St. Joseph Cemetery at the corner of FM 536 and 281. St. Joseph Catholic Church, which was located about a mile to the east of the cemetery on FM 536, burned to the ground in 1983. The church was over 100 years old at the time. A monument now stands on the old church site, located at the intersection of FM 536 and Las Gallinas Rd. 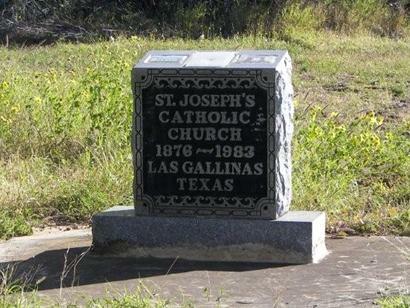 "St. Joseph's Catholic Church 1876-1983 Las Gallinas, Texas"
Over the years there have been much confusion regarding Leming & Las Gallinas. Many people think they are one and the same--they are not--they are two distinct and separate communities. I grew up in Las Gallinas, and still own property there. The main reason for the confusion is there are no highway signs indicating the community of Las Gallinas, or the Las Gallinas Creek, which runs through it. I would appreciate you correcting your article regarding Leming, which was never the community of Las Gallinas. Leming did not come into being until the early 1900's when the railroad came through. Las Gallinas already was there for several decades--and it is still there.